Just the kind of beaches you find in the tourist brochures. Coconut trees swaying over fine, white sand, lapped by clean, turqoise water. Some are virtually deserted for you to enjoy to yourself, while others like Chaweng have the locals to serve you everything you may desire from food, drinks and massage to arts and crafts. Get a massage, have your hair braided, buy barbecued chicken, sarongs, get to know the locals with their happy smiles and gentle nature. 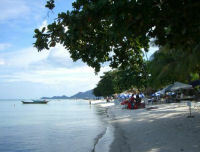 Chaweng Beach, on the east coast of Koh Samui, is a classic tropical beach in all respects. 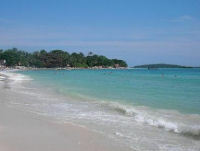 Stretching for 6 kilometers, it is the longest strip of beach on the island. Near to all the action, Chaweng is the most popular offering a wide range of facilities from the luxurious to the very basic with a corresponding range of prices. The strip splits naturally into three sections, with the resort town located in the central area. In recent years it has developed into the island's second largest town and is a magnet to visitors from all over the island. All the shops and bars are easily accessed from the beach with many of the traders happy to come and serve you on the beach. Samui's busiest tourist location is compressed into 7 km of some of the Island's finest surf and sand, with a huge variety of activities to suit everyone's budget.